In order to ensure its racial, ideological, and strategic interests, the Hitler regime actively supported the status quo in Palestine and the Middle East during the interwar period. 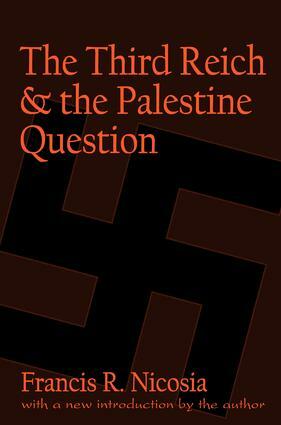 This included the perpetuation of British imperial power in Palestine, the Jewish National Home (not an independent Jewish state) promised by the Balfour Declaration, and the rejection of Arab self-determination and independence.The Third Reich and the Palestine Questionis the first comprehensive study of German Palestine policy during the 1930s. Francis R. Nicosia places that policy within the context of historical German interests and aims in Palestine, the Middle East, and Europe from the Wilhelminian era through the Weimar period and the Third Reich. He also provides insight into the broader foreign policy aims and calculations of the Nazi regime throughout the Arab Middle East before World War II.In a new introduction, Nicosia places his ground-breaking research in its proper historical perspective. He reviews some of the recent literature on the history of Nazi Germany and the Holocaust. He also discusses some of the archival materials that have recently become available in the former German Democratic Republic and Soviet Union.